Attackedastoria Nails: Beware the kraken! I love tentacled creatures.. octopi, squid, sea monsters, they're all so neat. 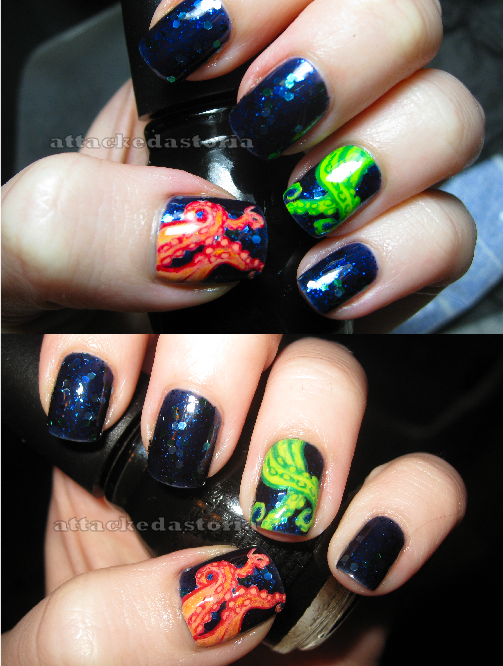 I've been wanting to do a tentacle mani and finally got around to it. I used Deborah Lippmann's Across the Universe as my base and I'm so happy I did.. it looks very seawater-y, doesn't it? I like it. And since I'm on a glow kick, the tentacles glow in the dark too! I wish I could get a picture of it, but it never turns out when I try. I'd love to know you you made it! How do you do this with regular nail polish? It is not as forgiving as acrylic paint. Wow, I am just amazed. This is awesome. I can't but agree with Sonoma Bento; I'm utterly stunned that you managed to pull this off with polish. So bloody fantastic! That is beautiful! So perfect and clean too. I actually find polish easier to deal with in most cases.. the acrylic paint I have isn't the best and it's too fluid and not as opaque as I'd like. Polish is usually very opaque and thicker and I just find it easier to control and get precise details. Ah, these are too cool! Awesome! The detail on this is great! Oh wow! These are really cool!